Scrooge McDuck or Uncle Scrooge is a fictional Scottish Glaswegian anthropomorphic duck created by Carl Barks that first appeared in Four Color Comics #178, Christmas on Bear Mountain, published by Dell Comics in December, 1947. 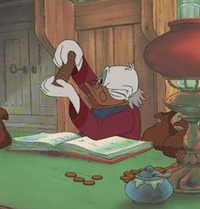 Over the decades, Scrooge has emerged from being a mere supporting character to a major figure of the Duck universe, even giving it its popular name Scrooge McDuck. In 1952, he was given his own comic book series, Uncle Scrooge, which still runs today. As the character's popularity rose, he appeared in various television specials, films, and video games. Scrooge, along with several other characters of Duckburg, has enjoyed international popularity, particularly in Europe, and his books are frequently translated into other languages. Scrooge's name is based on the miserly Ebenezer Scrooge, a character from Charles Dickens' 1843 novel A Christmas Carol.